The Museum has recently taken proud ownership of a partially restored forward cockpit section of a Junkers Ju88A-1 ‘Schnellbomber’ (High-speed bomber). This wonderful exhibit will form the centrepiece of the new Museum wing due to open at Easter 2009. The aim of this long-term project is to restore the cockpit section to the rearward facing gunner’s position. The operational history of this particular German bomber is being researched and it is known to have been constructed in 1940 and to have served with a Luftwaffe bomber unit during the Battle of Britain, prior to further service on the Eastern Front. The unit markings applied to the aircraft are those belonging to Kampfgeschwader 54 ‘Totenkopf’. Apart from the complete Junkers Ju88 on display at the RAF Museum, Hendon, the Ju88 cockpit section now on show at the Shoreham Aircraft Museum is believed to be the only other substantially intact example of this aircraft type in Great Britain. 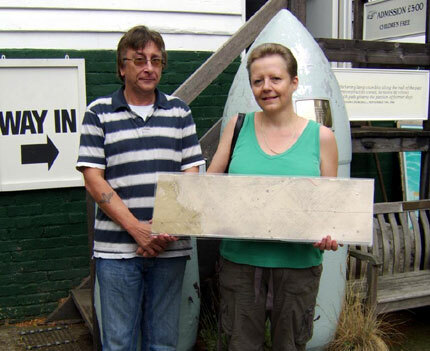 What must be a unique relic and wonderful piece of local wartime history was recently kindly donated and brought along to the Museum by Karen Harwood. Seemingly at first glance to look like a piece of scrap timber, it is in fact a length of old staircase that once led down to a cellar being used as an air raid shelter during the Second World War. In 1940, an unknown but enterprising individual wrote the date and time of every air raid warning after each time they descended the stairs to seek shelter during The Blitz. The log begins in October 1940 and continues into 1941. There is even mention of the terrifying ‘Doodlebug’ V-1 Flying Bombs that began to arrive in June 1944. This wonderfully preserved piece of local history was rescued from a home in Bromley, Kent, currently used by the Leonard Cheshire Disability organisation that has been undergoing renovation and was saved from destruction by Mr Donald Laing. 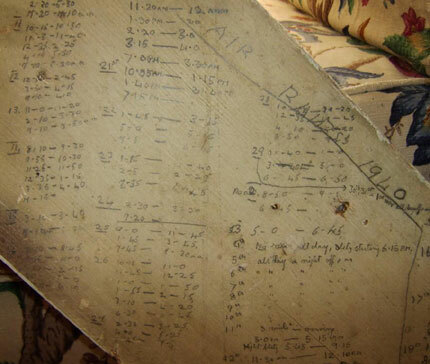 If anyone has a recollection of this air raid log and who might have been the person to have written it, then please do contact the Museum. You are currently browsing the Shoreham Aircraft Museum – News archives for August, 2008.